Port Blair, Aug 14: The permanent building complex of the Andaman and Nicobar Islands Institute of Medical Sciences (ANIIMS) will come up at a picturesque location at Corbyn’s Cove Extension. The Foundation Stone Laying Ceremony for the building was held at the venue this evening wherein the Lt. Governor, Lt. Gen AK Singh (Retd.) was the chief guest. The Member of Parliament, Shri Bishnu Pada Ray was the guest of honour on the occasion. Also present were the Chief Secretary, Anindo Majumdar and Pr Secretary (Health), Shri Raajiv Yaduvanshi. The Lt. 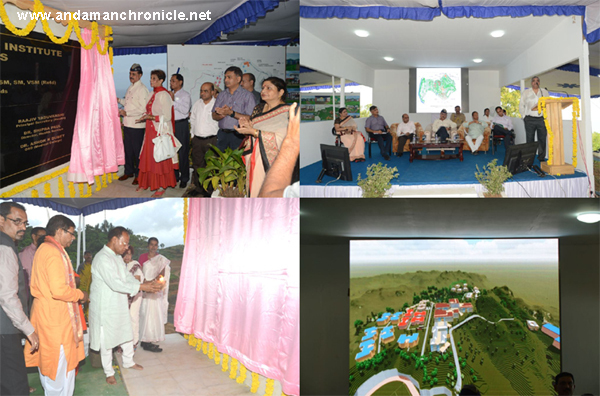 Governor, along with other dignitaries unveiled the plaque marking the foundation laying for the project. An all religion prayer was also held on the occasion. Among others the function was also attended by the First Lady, A&N Islands, Smt. Suneeti Singh, Chairperson, PBMC, Smt. Sheela Singh, Adhyaksha, ZPSA, Smt. Minati Biswas, Smt. Rupa Ray, DGP, A&N Islands, Shri Rajesh Malik, ACCI President, Shri Girish Arora, Councillors, PRI members, Medical Consultant and Director of ANIIMS, DHS, Senior Officers of the Administration, other HoDs, Doctors and students of ANIIMS. In his key note address, the Lt. Governor called the occasion as a great moment, as the dreams of the Islanders to have a Medical College is beginning to fructify. “I am confident that the Medical College will serve the Islanders greatly”, he said complementing all the Islanders for this landmark achievement. The Lt. Governor also thanked the Hon’ble Prime Minister, Shri Narendra Modiji, under whose vision and support the Medical College could be established in these Islands. He also thanked the Political and public representatives including the Member of Parliament for their support in shaping the Medical College. The Lt. Governor also thanked the Chief Secretary, Principal Secretary and others who contributed in the establishment of this Medical College, both the past and present teams. He specially conveyed his appreciation for the work done by the Medical Consultant, the Director, DHS and their teams. He also mentioned about the recent visit of the MCI team who did not make any observation and have rated the present Medical College of A&N Islands as very good. The Lt. Governor also complimented the first batch students of Medical College as they are the pioneers of this College and urged them to work hard and become top class doctors. “This year 225 students have qualified in the ANIPMT”, the Lt. Governor said and asked the Chief Secretary and Principal Secretary to start preparing our students well in advance for the next year’s examination to be held on all India basis (NEET). Regarding the quarry near the site of ANIIMS, the Lt. Governor asked the Principal Secretary and Deputy Commissioner to look into the feasibility of having an alternative quarry site. He also desired that street art could be used on the rock face to beautify the area. He called upon all the Doctors to work in synergy and serve the people of the Islands. Expressing confidence that our doctors are committed to give the A&N Islands their best, the Lt. Governor assured that the Administration is striving towards providing even better health care facilities in the far flung Islands. He also mentioned that the College of Nursing will start functioning from September 15 onwards while a Trauma Centre with state of the art facilities and dedicated team of doctors besides a Cancer Care Centre will also be put in place in this financial year. He also spoke about the ANISHI scheme under which 818 people have been benefitted so far, availing free medical treatment on the mainland. Lt. Governor concluded his speech by praying to Almighty to bless the people of the A&N Islands and all the projects meant for the welfare of the people here. He expressed his satisfaction on the development of A&N Islands during the last three years, saying that he has tried to serve the people to the best of his abilities and with full committment. In his address on the occasion, the Member of Parliament, Shri Bishnu Pada Ray spoke about his experience when he recently visited J&K and expressed his gratitude to the defence forces for their services for the Country and its people. He made suggestions on the Medical College and lauded the doctors of the A&N Islands. The MP urged the Administration to get medical machineries under Annual Maintenance Contract (AMC) and also to engage isles’ doctors to teach students. Medical faculties from MIOT, FORTIS can also be brought so that the students of ANIIMS get more exposure, he said. The MP lauded the students of A&N Islands studying in ANIIMS and had a special mention of Ms. Tasleen Banu who topped the first year examinations with an astounding 77.3% marks, securing distinction in all the 3 subjects of Anatomy, Physiology and Biochemistry. He also recounted his work in various Parliamentary Committees. In his address on the occasion, the Chief Secretary, Shri Anindo Majumdar stated that the stone laying for the new campus is another milestone achieved by the Administration under the able guidance of the Lt Governor. The Chief Secretary urged the faculty members of ANIIMS to put their best efforts in making this medical college a centre of excellence. “The Medical College is not only for the students but also for the people of these islands who will get specialised medical care. The specialists will also be deputed in Inter-Islands so that the people residing there get better health care”, the CS added. From next year, the students intending to get admission in medical college will have to compete at the national level by taking common entrance exam NEET as per the Supreme Court order, the Chief Secretary said urging the students to work hard. The consultant ANIIMS, Maj Gen. Dutta presented the project outline through a power point presentation. “Four decades old dream of the Islanders since 1969 to have a Medical College in isles has been fulfilled in 2015-16”, he said adding that the ANIIMS is the first Institute to be established under the visionary and ambitious centrally sponsored scheme of Hon’ble Prime Minister, Shri Narendra Modi. This vision has been translated into reality under the leadership of Hon’ble Lt Governor. Earlier welcoming the gathering, the Principal Secretary (Health), Shri Raajiv Yaduvanshi said ANIIMS, the first Medical College of Andaman and Nicobar Islands became functional in 2015 with 100 students, who were admitted in the College. Of them, 85 were from A&N Islands while 15 were from all India quota. “The Medical College has been set up with the State of Art facilities and the campus has been planned in this picturesque location”, he said thanking the Lt. Governor for his fervent efforts in materializing the dreams of the Islanders. He also thanked the Member of Parliament for his support and guidance in this regard, the Consultant from ANIMERS, Maj. Gen AK Dutta also for his guidance. He further said the medical college has been set under the Centrally Sponsored Scheme under which 75% of the funds are provided by the Central Government while the 25% is to borne by the UT Administration. He informed that the total cost of the Medical College is Rs.342.14 crore. While Rs. 213.8 crores was sanctioned by the Ministry, Rs.71 crores is being spent by the UT Administration. On the occasion, a 3D model of the proposed Medical College campus design by Technical Teams from ANIMERS was also screened. The foundation laying ceremony concluded with the vote of thanks proposed by the Director, ANIIMS, Maj. Gen. RP Choubey (Retd).